For singer Hong Jinyoung, right now is her most enjoyable day. As much as she worked hard in every moment to get to this point, she is receiving a lot of love. From music to varieties, Hong Jinyoung’s height of prosperity continues. Especially recently, she appeared on SBS ‘My Little Old Boy’ and became a topic of conversation for days on end. From romantic atmosphere with Kim Jongkook to an appearance accompanied by unnie Hong Sunyoung, she monopolized the topic of conversation. Especially on ‘My Little Old Boy’, you could see a new side of Hong Jinyoung through her chemistry with unnie Hong Sunyoung, who is overflowing with excitement. Hong Jinyoung said, “We finished filming about 2 months ago. I did predict that it would be fresh since it’s the first time unnie was unveiled to viewers” and reflected back on the reaction at the time saying, “But I didn’t know it would be this huge. Even when my name is not there, unnie’s name was on the popular keyword searches”. Every variety show that Hong Jinyoung appears on explodes properly. From ‘Omniscient Interfering View’ to ‘My Little Old Boy’, Hong Jinyoung is on popular variety shows. She said, “I receive many proposals for broadcast appearances but due to my busy schedule, it’s difficult to appear on them all” and said, “Broadcast of ‘My Little Old Boy’ was filmed a while back and I couldn’t have predicted (its popularity) either. Programs that I had filmed earlier are coming one by one, so people think even more so that I don’t rest at all”. Hong Jinyoung will continue to ‘work hard’ until the year end. She will release a new song ‘서울사람’ (translates to ‘Seoulite’, ‘Seoul person’; a person from Seoul) joining producer Park Geuntae’s project. This trot song is a collaboration of producer Park Geuntae and lyricist Kim Eana, and the participation of ‘trot queen’ Hong Jinyoung has been drawing anticipation. From varieties to releasing a new song and even various events, Hong Jinyoung is always running. She said, “Someone told me I’m a ‘happiness virus’” and she laughed saying “I read a comment that said that because I am always laughing even when things are difficult”. Singer Hong Jinyoung is receiving love from men and women of all ages with her witty words and actions. She especially received the love of mothers of celebrities on SBS ‘My Little Old Boy’ and ascended as the ‘nation’s daughter-in-law’. Recently, Hong Jinyoung has showcased various contents and expanded her domain. From YouTuber ‘Samba Hong’ to songwriting and launching a makeup brand, she’s living a life where 24 hours is not enough. Singer Hong Jinyoung unveiled her dream of becoming a manager and producer. Many broadcasting stations proposed a collaboration for Hong Jinyoung’s ‘Hongdition’ but she said, “I want to do it in a more fun and diverse format so rather than a (television) channel, I’m thinking of a different direction” and was sure of herself saying, “I’m planning ‘Hongdition’ through YouTube ‘Samba Hong”s new channel. I think it will progress more freely if it’s on YouTube”. I met ‘Godttery’ Hong Jinyoung (33). As soon as she started talking, her first phrase was overflowing with charm. I am familiar with her cuteness but it’s our first time meeting as interviewer-interviewee and it feels different. Like a singer who helped bring young trot to the music industry, following in the footsteps of Jang Yoonjung, she has an energy that makes the environment around her brighter. She says just to coolly call her ‘trot vitamin’. It really feels like I’ve ingested vitamins. At the <The Fact> Sangam-dong office on the 24th, Hong Jinyoung visited, who is garnering attention for pioneering new trot genres like ‘bbongDM’ and ‘bbong-llad’. Our editor colleagues who are indifferent to celebrity appearances display interest with at least one gaze in her direction. Recently, she created news and trends in each program she appears in with ‘Hidden Singer’ and ‘Carefree Travelers’, creating the realization that she is a trendsetter in variety entertainment. Hong Jinyoung’s rise has been confirmed by placing 2nd in female advertising model brand ranking this past April, setting her place as a blue chip in the advertising world. What is her secret to surprising influence even though she promotes in a non-mainstream music genre? From exceptional vocals to excellent songwriting abilities, it’s thank to her disposition as a multi-faceted entertainer that attracts a variety of audiences all at once. After achieving ‘trot fairy’ and ‘trot goddess’ status, we met Hong Jinyoung, who has gotten public popularity as a ‘trot vitamin’ personally, to dissect her secret to popularity and charms. This is the topic of the first part of the special interview. I think you’re enjoying all of the popularity in the entertainment world alone these days. I personally appeared on the entertainment talk show ‘Rumor Has It’ for nearly a year with you and built a relationship but meeting like this is new. That’s right, it has already been 2 years. It’s so nice to meet you like this. Your image is completely different from when you were on the panel to a journalist in a newspaper editorial department. Honestly, while I was the MC for that program, I learned a lot about the physiology of the entertainment world from the journalists. Perhaps that’s when my popularity spiked again. During her time as ‘Rumor Has It’ MC, Hong Jinyoung had a reputation as the set mood maker. Since her schedule is so busy, there were a couple of times when she asked us ahead of time to understand having to change the filming day, but she was never late once or inconvenienced anyone. Even though she had regional schedules in the early morning, she always showed her face at late dinners after filming ended in the middle of the night, showing her sincerity. What do you think the reason that everyone likes Hong Jinyoung? You must have your own set of standards although you promote as a star singer for the general public. I always keep an optimistic mind, a thankful heart and live by the principle that I should care for others. People say if you can’t avoid it, enjoy it. If I’m going to have hardships and have encounters regardless, I should do it with an enjoyable heart. You ranked up to 2nd in the advertising model brand ranking. How many CFs did you shoot? Is it okay to say this? I think I’ve filmed 25 just this year. There are many one-time CFs but I also have several that run for 1 year. Guarantee? I’m not as expensive as you’d think. From the perspective of advertisers, I’m cost-effective so wouldn’t that be why I’m used often? Hahaha. Even 3~4 years ago, Hong Jinyoung continuously shot 5~6 CFs a year. Her activities were gradually noticed and received attention from the advertising industry and her popularity climbed sharply last year. Although entertainer Kim Saengmin received attention for filming 20 CFs before his ‘Me Too’ controversy, Hong Jinyoung deserves to be called the blue chip of CFs. Among singers, you tend to have many events. What do you do if it conflicts with broadcasts? I do tend to have a lot of schedules. Broadcasts are important but it’s difficult to give up events. So these days, I’m not able to make fixed appearances in a program. Most of the broadcast appearances I’ve made this year are short-term and as a guest. Since you are doing so well, there are many people who are curious about your event pay. Do you like the nickname of ‘trot fairy’? It’s an honorable name that fans have given me so I can’t say I like or don’t like it. But personally, I like ‘trot vitamin’ even more than ‘trot goddess’ or ‘trot fairy’. If you call me that, I’m more thankful and happier. Like vitamins, I want to give a lot of vitality. I understand you originally debuted as an idol, in a girl group. What’s the reason behind your transformation to trot? I was reluctant to give up being in a girl group so I really didn’t want to convert to trot. I was actually very upset to release a song and promote as a trot singer at such a young age (mid 20s). I didn’t like getting attention for changing to trot after having failed in a girl group. Based on the mood back then, it wasn’t an easy choice. The optimistic thought that trot is getting younger was one that I could only have way later on. Do you think you’ve played a role in spreading trot as a popular genre across the country? In the trot world, there are many prominent sunbaenims (senior singers). Since I’m active on top of the groundwork that they’ve laid down, I’m actually reaping the benefits. Even when I first stepped into this world, I couldn’t imagine such public popularity. I need to repay now. I need to play my role to spread this genre with a bright and fresh mood so that we can receive a lot of love, even among the young generation. After ‘Love Battery’, Hong Jinyoung continuously released songs and with her recent song ‘Good Bye’, she once again pioneered another territory in trot. ‘Good Bye’ is a collaboration song between the music industry’s hit-makers Jo Youngsoo and Kim Eana and it’s a retro trot song that captures your ear even if you only hear it once. Even within trot, do you think there is a Hong Jinyoung style? Since I was a rookie, I wanted to show my own unique color. ‘BbongDM’ (a new word that combines trot and EDM) which infuses exciting and fast electronic music to the typical trot genre is a style that suits me. ‘Amor Fati’ that Kim Yonja sunbaenim sang is like that too. It received the spotlight for enhancing excitement by adding electronic dance music (EDM) to a trot melody. Singer Hong Jinyoung (33) re-signed with her agency Music K Entertainment (CEO Kwon Changhyun) early this year and definitively maintained a 10-year long loyalty. Her deep confidence in CEO Kwon, who has been with her since her debut in 2008, continued with her contract renewal. When CEO Kwon became independent of the previous agency and established Music K, Hong Jinyoung naturally made a new home there. Music K has been enjoying Hong Jinyoung’s stable public popularity and brought to life a new rookie boy group, walking a very strong path. After placing 2nd in the female advertising model brand ranking this past April, Hong Jinyoung rose as a blue chip in the advertising industry. What is her secret to surprising influence even though she promotes in a non-mainstream music genre? From exceptional vocals to excellent songwriting abilities, it’s thank to her disposition as a multi-faceted entertainer that attracts a variety of audiences all at once. After achieving ‘trot fairy’ and ‘trot goddess’ status, we met Hong Jinyoung, who has gotten public popularity as a ‘trot vitamin’ personally, to dissect her secret to popularity and charms. This interview was conducted at the <The Fact> Sangam-dong office on the afternoon of the 24th. What is the source of Hong Jinyoung’s energy who is continuously active? It’s the passion and spirit of challenge of an optimistic mind. It’s exciting to have a lot of attention and popularity but if there is too much work, it’s difficult for your body and mind. That’s when it’s important. If you always have a positive mind, even when you fail, it becomes a good experience. Do you find plastic surgery controversies uncomfortable or upsetting? If I said they weren’t, that’d be a lie. But I don’t really pay a lot of attention. Double eyelid and nose plastic surgery have become normal procedures that anyone can do, and I have acknowledged it myself and revealed which parts I’ve enhanced. It’s not even a controversy. In her own episode of JTBC ‘Hidden Singer 5’, Hong Jinyoung unveiled where she had cosmetic procedures done. Judging panel compared her appearance from when she was promoting in the group Swan to now and said “Nothing has changed except your double eyelids” and Hong Jinyoung coolly confirmed “What changed since then is my nose” and received ‘very Hong Jinyoung-like’ comments. Who are your celebrity bosom friends? There are many people I’ve gotten close to through entertainment programs. Pro entertainers like Kang Hodong, Kim Youngchul and Heo Kyunghwan take care of me. We have a thick bond, so when we meet we are naturally playful and joke around. Hong Jinyoung composed ‘I Kicked My Luck Away’ sung by Kang Hodong and ‘Ring Ring’ sung by comedian Kim Youngchul last year that had a hot reaction. After receiving the hit ‘Ring Ring’ from Hong Jinyoung, Kim Youngchul also received a new song, ‘Andenayon’. 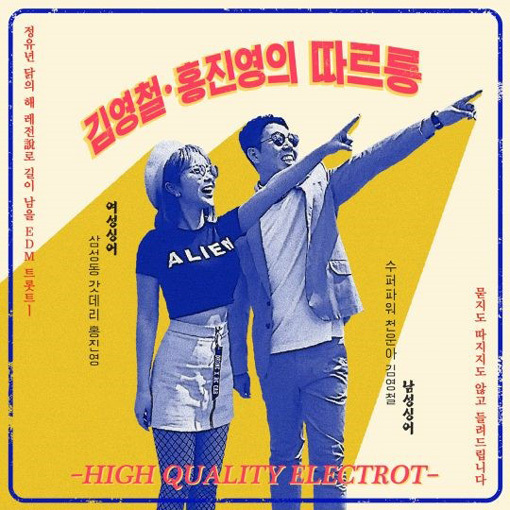 Both are fast electronic music (EDM) and are characterized by exciting rhythm enhanced by Hong Jinyoung’s unique refreshing and bright color. Doesn’t your busy schedule wear down on your stamina? There are times when my stamina runs out while going all over the country by car. But I naturally tend to eat anything well so there is no reason for my strength to be depleted. If I work excitedly, I automatically get an endorphin boost. What kind of exercises do you normally do to maintain your stamina? If I’m being honest, I don’t exercise separately these days. No, I can’t do it. You need to make time to exercise and I start moving early in the morning and if I end work early, it’s 11 PM at night. Don’t you need to maintain your figure? Thankfully, singing and moving on stage requires an immense amount of stamina, and with that, I automatically diet. So typically 3~4 kg of weight come and go depending on my stage schedule. What is your best charm in your opinion? It’s my personality that is never satisfied by reality. My style is one that endlessly creates work, clings to it and carries it out. That’s why I’m always busy. Depending on how you see it, it could also be a shortcoming, but in my opinion, I think it is my biggest strength and charm. There is exactly one thing I’m curious about. How much alcohol can you drink? Is it because of my style normally? How much alcohol I can drink is one of the most frequently asked questions. Do I look like I can drink alcohol well? I’ll confess now, even when I drink one glass of beer, my face turns red. I can barely drink alcohol at all. If I force myself to drink sometimes, I can drink up to 3~4 shots of soju, but those days are very special days. When was the most difficult time after your debut? There are many celebrities who became Cinderella overnight but it was difficult for me from the beginning. While I was doing plays when I was 20 years old, I fostered a dream of becoming an actress and gave it up, and I attempted a girl group debut but it wasn’t easy. Even after my trot debut, I encountered countless difficulties in order to become acknowledged. More than anything, there was no incline to lean on so it was difficult. Fans have a lot of interest in your thoughts on marriage. I don’t have any specific plans on marriage. I can only date when I have time. It’s not an exaggeration but I really don’t have time to date. I should get married, when I find a good person. I wanted to ask you this point-blank when I met you. What kind of a relationship do you have with Kim Jongkook? Huh? What is this, all of a sudden? Kim Jongkook oppa is a great friend in the entertainment industry. It’s true that he unreservedly takes care of me as a hoobae but rationally, we don’t have an intimately close relationship. Of course, it’s not that there isn’t any leeway, keke. Is there anyone who’s in your heart? To tell you clearly, there is no man I’m dating right now. I have dated an ordinary person. As I became incredibly busy, we grew apart naturally. Affection between a man and a woman deepen when you meet often but it’s sad since I can’t do that in reality. What is your ideal style in a man? I like people who are good-natured and comfortable. Whether they are younger or older, I like men who have a kind disposition rather than their economic capabilities. If you had to choose one from male celebrities who are active now? Actor Cho Seungwoo without double eyelids is exactly my style. I’ve never met or had a conversation with him. I just mean that his aura and image is one that I’m attracted to. Lastly, how does it feel to receive a lot of public popularity and love? It’s forever exciting. More than anything, I like the feeling that trot is getting younger. Even when I debuted, trot was largely regarded as the exclusive domain of the elderly. When I go to university events, I sing EDM versions of my songs and it’s difficult to differentiate the excitement for idol singers. I hope trot continues to progress as a genre that’s familiar to anyone. Interview with Hong Jinyoung was pleasant and exciting from beginning to end. It was kind-hearted for her to make time to come by the office, not forgetting the promise, even though she was on her way to a regional event. It was as though I didn’t realize 1 hour and 30 minutes of time passed by. If the manager didn’t point to the clock and urge on so that she can do her next schedule, we could have continued for another hour. What content will fill the next interview with her? I’m already looking forward to that time. If there are stars who are difficult to approach even though they are popular, there are also stars who you’re happy to greet and hold hands with as if you’ve known for them for a long time even though it’s your first time meeting them. There’s no need to explain which side singer Hong Jinyoung (33) falls on. From continuous new songs, event stages she restlessly stands on all over the country and to TV entertainment programs she’s all over where she shows her charms. Hong Jinyoung, who seems like she lives her life split up by the minute, wants to enjoy her daily life and says “I never want to settle”. For ‘conversations with female journalists’, she sat oppositely me despite a busy schedule and even on that day, it was after she had finished an event at a department store in Seoul. After the interview, she headed to Daejeon. When I asked her if she is tired, she said “When I’m at least a year younger, when I still have passion left, I want to attempt even more.” Along with her unique eye smile. I met Hong Jinyoung, the person with relentless energy and whatever she does becomes explosive. It seems you’re really busy. Does your popularity feel real? Tell us your tips for positive energy. It seems you tend to read comments often. Source of Hong Jinyoung’s aches came from her appearance on MBC entertainment program ‘Omniscient Interfering View’. It honestly showed her close appearance with her manager who she spends most of her days with but a portion of the viewers saw it and were not happy. Their reason was that it was ‘too much’. As time passes, and as she gains experience, Hong Jinyoung is finding her boundaries. Her thoughts are to “Show exactly who I am, and don’t create something over the top”. Even the recent heartaches she experienced, she didn’t step out of her house for two days and endured it alone to be able to shake it off. Hong Jinyoung debuted in a girl group but wasn’t able to receive a lot of attention. She didn’t get discouraged and stepped onto the path of trot, a choice that can’t have been easy for a singer in her 20s, and became the ‘current trend’. ‘Love Battery’ which she released in 2009 was the start of her popularity. She strengthened ‘youthful trot’ that was created by Jang Yoonjung and Park Hyunbin and expanded her areas of activity. She appears on all kinds of entertainment programs, from reality, observation to variety. Her recently released song ‘Good Bye’ is popular too. Last year, comedian Kim Youngchul sang ‘Ring Ring’, a song she composed and wrote, and it became huge. Hong Jinyoung said, “I want to show that you can do a wide range of activities even in the genre of trot” and “Like how I realized trot can be young while watching (Jang) Yoonjung unnie and (Park) Hyunbin oppa, I want junior singers to look at me and help them expand their outlook with trot”. Are you eyeing the royalties from ‘Ring Ring’? Reactions to ‘I Kicked My Luck Off’ sung by Kang Hodong was good too. Do you have more songs you’ve composed and wrote? When you open your eyes in the morning, what do you do first? The description ‘Queen of Events’ suits you well. Another area where you can sense Hong Jinyoung’s popularity is advertising. She is the advertising model for 8 brands, including cosmetics and chicken. Recently, she added karaoke machine advertising to her roster. Hong Jinyoung said, “Starting this year, I’ve had big luck. Even when you say you got lucky, your life is what you make of it”. You must think of marriage nowadays. How do you maintain your health? Hong Jinyoung’s manager who was listening to her words beside her shook his head saying “I wish you wouldn’t”. His gaze wanted her to stop creating so much work. It’s the manager who appeared on ‘Omniscient Interfering View’ with her. Off-camera, the two people seemed to have deep confidence in one another as partners who work together. What kind of a person is Hong Jinyoung viewed from Hong Jinyoung’s perspective? Hong Jinyoung is a ‘girl boss’ who has an entrepreneurial streak. She’s also a woman of ‘action’ who puts the ‘picture’ she envisioned in her head straight into action. Although she quietly closed down the internet shopping mall that she started with her sister 2 years ago because it was difficult to maintain, she’s not afraid of failure and she’s endlessly thinking of businesses daily thinking ‘What should I try this time?’. Currently, the business item that she’s planning is a ‘photo app’. She really likes to take photos so there aren’t any photo-related applications she hasn’t used. However, none of it was able to meet Hong Jinyoung’s standards. She made her own thinking that it would be good to create an app that combined all of the best parts of various apps. The photo app that Hong Jinyoung created will be pay-to-use and release in June. She learned coding with the help of an acquaintance so she is planning to use the profits for a good cause. This plan won’t end with a one-off and she wants to hold it every year so next year she’s planning to create a ‘3-member trot group’. Source of new ideas come from Hong Jinyoung’s personality. Since her life philosophy is ‘In a fun way, no matter what’, various ideas come to mind like a spring that will never go dry.